Leaving our brains frazzled and fried, Nozstock Festival sufficiently surpassed all of our expectations. An unforgettable weekend compact with thrills, the boutique event showcased some of the finest musical talents stemming from our shores; a combination of veteran and up-and-coming musicians who each lived up to the occasion magnificently, collaboratively ensuring Nozstock’s most exciting and successful event to date. To help us try to encapsulate the true Nozstock emotive, we’ve spoken with Hip Hop MCs Cracker Jon, Tommy Dockerz and Toast Based Dinners to give you their take on the manic weekend alongside ours. Here’s a rundown of some of our first hand, up close and personal experiences at Nozstock Festival 2014. 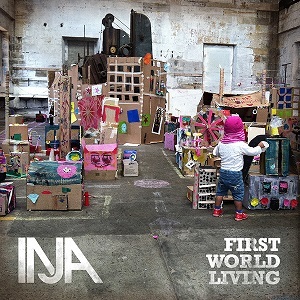 After a hiatus from hip-hop Inja recently released the heavily anticipated ‘First World Living’ EP, and you can be assured that it bangs just as hard as his prior 2012 project ‘Bass Music Escapism’ where he left off. An artist gradually ingrained at the forefront of both hip-hop and drum and bass culture over the past two decades, his first appearance was on the 1999 ‘Delegates of Culture’ self-titled release, featuring on the Headcleaners mixtape in 2000 alongside hip-hop heavyweights Roots Manuva and Task Force. Just a few years later Inja started his own music label ‘Inja Nu Records’ to drop his first solo LP ‘The Suffering In Silence’. The ‘First World Living’ EP was dropped on Audio Danger Records, a relatively up-and-coming Cambridge based label that releases both hip-hop and drum and bass in the purest underground form, on November 17th. It certainly takes something special to pave a path to success in the current hip-hop climate. Cincinnati’sBuggs Tha Rocka had an early ambition to take his music in the same direction as hip-hop legends Q-Tip and Biggie. Beginning with the release of his first mixtape ‘Hip Hop Supa Hero‘ hosted by Mick Boogiein 2009, Buggs caught the attention of locally established artists Donte (MOOD) and Hi Tek (Reflection Eternal) who recognised his potential and helped with Buggs’ gradual progression into the hip-hop industry. From Cincinnati Ohio, Buggs Tha Rocka has been brewing up a storm in his hometown since releasing his debut mixtape ‘Hip Hop Supa Hero’ back in 2009. Having caught the attention of acclaimed local artists Donte (MOOD) and Hi Tek (Reflection Eternal) he soon established a reputation as one of Ohio’s most talented emerging artists, culminating in his title as “Hip Hop Artist of 2014” at the Cincinnati Entertainment Awards. Legendary hip hop figure Talib Kweli is one of many to have endorsed the rapper’s lyricism, featuring Buggs on his Prisoner Of Conscious Tour in 2013 and once again sharing the stage at this year’s A3C Festival in Atlanta. A collaboration so sinful that it may well have been selected by Satan himself, lyricists Lee Scott (Blah Records), Trellion (Bad Taste), Milkavelli (Piff Gang) and producer Sumgii (LDZ) make up the unrighteous movement that is Cult Mountain. If you caught our review of The Guilty Party’s last event featuring Jehst, Strange U & more you already know how hyped we were to return to the Belgrave Hall, Leeds back on December 5th to catch their latest showcase featuring undisputed hip-hop heavyweight Kyza Smirnoff and Bristol’s livest hip-hop collective, SplitProphets. For those unaware, Kyza has been at the forefront of the UK scene since the turn of the new millennium. His origins stem from N.W.C (North-West Collabo) alongside veteran producer Micall Parknsun, who spotted his potential and connected him with Lowlife Records, collaborating with iconic artists such as Jehst and Chester P before proceeding to join forces with Klashnekoff, creating the Terra Firma collective which has produced some of Kyza’s most acclaimed material before leaving in 2006 to begin focussing on his solo career. Kyza’s last solo project, Hibernation, dropped in August and was complimented by Wordplay Magazine as “the rebirth and reintroduction to Kyza Smirnoff“.